The Research Data Management (RDM) teams of the Risk Management Quality Assurance (RMQA) and the Social Science Division (SSD) conducted a basic research data management training workshop to address the risk of loss of research data, on last 6-7 May 2014 at the SSD Conference Room. The workshop focused on areas of RDM that includes documentation and metadata creation, and data sharing and archiving. Dr. Val Pede, deputy head of SSD then, stressed the importance of keeping quality research data safe and accessible during his opening remarks. Menchu Bernardo, RMQA senior manager, discussed the different risks and impacts in data management while Dehner de Leon, chair of the SSD-RDM committee, shared the results of the risk assessment and the measures to be taken with the NRS and scholars from SSD and CESD doing household surveys who attended the course. Other resource persons from RMQA-RDM and SSD-RDM presented good practices on data security in the conduct of research. The training team is composed of Dehner de Leon, Esther Marciano, Malou Malabayabas (SSD-RDM), Menchu Bernardo, Icoy Mercado, and Dec Arreza (RMQA-RDM). Following its successful first two phases, the Stress-Tolerant Rice for Africa and South Asia (STRASA) project recently launched its third phase at its inception and planning workshop on 20–23 May in Delhi, India. Building on its already strong network of partners in India, Bangladesh, Nepal, and Africa, STRASA Phase 3 will have more focused and strategic approaches that will integrate efficient breeding pipelines with gender-focused monitoring and evaluation and dissemination roadmaps. STRASA, which continues to be the flagship program for IRRI, Global Rice Science Partnership (GRiSP), and the Bill and Melinda Gates Foundation (BMGF), began at the end of 2007 to develop and deliver rice varieties tolerant of abiotic stresses to the millions of farmers living in unfavorable rice-growing environments in Asia and Africa. “STRASA not only develops products but also develops strategies that help get its products into the hands of the right people,” said Bas Bouman, director of GRiSP. Gary Atlin, senior program officer for BMGF, emphasized how the project was extremely innovative during its two previous phases and looks forward to how STRASA will maintain its successes and impacts for the next 5 years. The event was attended by about 300 participants from South Asia and sub-Saharan Africa, including dignitaries from India, Bangladesh and Nepal. Subbanna Ayyapan, director general of the Indian Council of Agricultural Research (ICAR) and secretary of the Department of Agricultural Research and Education, thanked the project for its contribution in transforming poverty to prosperity for many people in underserviced areas. A new seed driller, designed by IRRI scientists for planting rice, maize, and mung bean, was field-tested before 100 farmer-leaders, municipal agricultural officers, and other representatives in San Nicolas, Pangasinan, Philippines on May 21-22. Unlike other models, the new multi-purpose seed driller does not require a four-wheel tractor to operate, making it ideal for farmers in rainfed lowland areas with smaller farms. The machine was conceptualized and designed by IRRI agronomist Yoichiro Kato and his team to provide farmers with the option to directly sow rice and other crops in their field eliminating the need to prepare nursery beds and transplant the seedlings. The problem with this, according to Dr. Kato, wasn’t simply the time and energy spent. More often than that, when rains don’t come, the rice seedlings cannot be transplanted or even die in the nursery so farmers need to repeat the process. Using their seed driller, it becomes possible for farmers to easily sow dry seeds directly into the dry soil so that their fields are ready when the rains come. “For rice, the amount of seeds needed is only 30-35 kilos per hectare compared with 2 bags for a hectare,” explained Niño Banayo, an associate scientist with Dr. Kato’s team. When it comes to sowing maize, the seed driller doesn’t only just drop seeds, but also fertilizer so farmers can save on two operations—sowing and fertilizing–at the same time. “I think this program is very good because it gives us an opportunity to see what we can adopt in our area especially those without irrigation,” said Reynaldo Dotimas, Municipal Agricultural Officer of San Nicolas, Pangasinan. Apart from the advantages of direct seeding, Dr. Dotimas also noted that, because the driller sows in rows, farmers wouldn’t have a hard time with harvesting and weeding. The multi-purpose seed driller features adjustable parts which control the distance between the rows. IRRI is currently holding the Rice: Research to Production (RR2P) course from May 19-June 6 at the IRRI Training Center (TC). The three-week course aims to create a new generation of plant scientists that are well-networked within the international community. The RR2P course provides participating scientists with an understanding of the importance of innovative plant science in solving global problems; the basics of rice production; the issues related to IRRI's germplasm exchange and property rights; the research issues affecting IRRI and its development partners; and effective international collaborations and planning as part of the international research community in the future. It also offers hands-on training in rice breeding, molecular genetics, and genomics. A total of 26 participants from Australia, Bangladesh, Egypt, India, Indonesia, Malaysia, Myanmar, the Philippines, Thailand, the United Kingdom, and the United States are attending the training. Members of the Training Management Team for the RR2P course are Dr. Hei Leung (plant pathologist and geneticist, CESD), Dr. Noel Magor (head, TC), Dr. Michael Thomson (molecular geneticist and marker applications specialist,PBGB), Dr. Susan McCouch (professor, Cornell University), Engr. Eugenio Castro Jr., (senior research manager, TC), and Maria Socorro Arboleda (senior training specialist, TC). The Board of Trustees of the Crop Science Society of the Philippines has elected its officers and board members for 2014-15, which include several IRRI staff members. President: Dr. Antonio Lalusin (UPLB); vice president: Dr. Ma. Rebecca Laza (IRRI); secretary: Ms. Reneeliza Jean Melgar (IRRI); treasurer: Dr. Victoria Lapitan (PhilRice); auditor: Dr. Marissa Romero (PhilRice); members: Mr. Arthur Baria (Nestle), Mr. Tomas Clemeno (Private), Dr. Felix Salas (VSU), Mr. Democrito Rebong II (PhilRice), Dr. Apolonio Ocampo (UPLB), and ex officio: Mr. Ramon Oliveros (IRRI). Also elected (not in photo) is PRO: Mr. Ambrosio Raul Alfiler (PCA-Albay). The trustees and officers were inducted by Ms. Corinta Guerta, IRRI’s Director for External Relations. IRRI researchers garnered several awards during the 44th Crop Science Society of the Philippines (CSSP) Annual Conference held on 12-16 May in Cebu City. Around 260 crop scientists, extension specialists, and professors from both the public and private sectors all over the country gathered to present their latest research results, outputs, and products in 69 papers and 120 posters with the this year’s theme, Harnessing Biodiversity and Biotechnology for Climate Change Adaptation. Anita A. Boling, Lizzida P. Llorca, Jessa G. Perez, Ruth Agbisit, Keiichi. Hayashi, Archie R. Llorca, Tsutomu Ishimaru, Hirofumi Sakuma, Hideto Fujii, Chay Bounphanousay, Khamphone Mounlamai, Prihasto Setyanto, Ismail Wahab, Flaviana Hilario, Benjamin K. Samson, Zulkifli Zaini, and David E. Johnson. Mary Rose Mabalay, Andy Nelson (IRRI), Tri Setiyono (IRRI), Eduardo Jimmy Quilang, Aileen Maunahan (IRRI), Prosperidad Abonete, Arnel Rala (IRRI), Jeny Raviz (IRRI), Roman Skorzus, Jimmy Loro, Francesco Holecz, Massimo Barbieri, Francesco Collivignarelli, and Stefano Monaco. In recognition of his rice breeding efforts and excellent leadership in directing a large research team resulting to at least 19 released stress tolerant varieties in the Philippines, India, Bangladesh, Nigeria, and other rice growing countries in Asia and Africa. In recognition of his outstanding contribution to plant breeding and genetics research with highly relevant and contemporary outputs generating huge impact to Philippine and international agriculture. specifically to small rice farmers. Dr. Paul Teng, former IRRI scientist and currently Professor of Biological Sciences, Nanyang Technological University, Singapore, and Chair, ISAAA Board of Trustees, delivered the keynote speech. Plenary speakers included Dr. Rex Navarro (CGIAR Program on CCAFS), Atty. Roberto Oliva (ASEAN Center for Biodiversity), and Dr. Nina Gloriani (Biotechnology Coalition of the Philippines). The third season of the experiential learning course Rice Survivor ended on May 22 revealing interesting rice yields from farm plots managed by participating IRRI staff. Five teams competed for the highest profit and yield as they learn the whole rice production process. This season’s teams were Team Agila, [B]IRRI-ani, Masigasig, Palay All Stars, and Ricesilient. All teams did more than survive the dry season as each were able produce at least 6 t/ha of rice. Palay All Stars bagged the first place with 8.27 t/ha harvest using the hybrid SL8 variety, and 7.7 t/ha harvest from NSIC Rc238. Members of the team were the only ones who did not use any pesticides in their field. Rice Survivor aims to provide IRRI employees (NRS, IRS, post-docs, and scholars) with hands-on experience in rice production and increase their appreciation for rice farming and the farmers. It also promotes team dynamics, inter-OU collaboration, and sportsmanship. Members of the team are a combination of rice breeders, plant pathologists, entomologists, chemists, molecular biologists, communication specialists, and administrative staff. They plan and decide on all crop management activities such as the varieties to use, fertilizer application, and control of pests and diseases. The participants also prepare the crop calendars, yield estimates, and budget inventories. The best Rice Survivor team was judged based on yield and profit. Awards were also given to outstanding individuals in the following categories: Best Blogger, Best Breeder, Best in Knowledge Sharing, Most Obsessive Record Keeper, Most Invested Survivor, Best Rice Girls, Best Paparazzi, and Highest Attendance. Janelle Jung of Team Masigasig added, “being able to take part in the rice farming cycle from seed to plate really gave me a better understanding of the complexities of rice production that we are trying to improve to achieve higher yields most efficiently and sustainably”. Rice Survivor was started in 2012 by IRRI’s Training Center under the creative leadership of Katie Nelson and Nicola Wunderlich. For the 2015 dry season Jason Beebout and Bryce Blackman will take over the facilitation of the experiential learning course . The Training Center is now preparing Rice Survivor Season 4 for and will select the next batch of participants in October. Manpower and equipment for land preparation, seed establishment, irrigation, and other production operations are provided by the Experiment Station. Expenses for fertilizers, pesticides, and seeds are also subsidized by the Institute. For the next season, IRRI Human Resources has also agreed to cover the cost of the course’s registration fees and transportation. The Risk Management and Quality Assurance (RMQA) training team concluded its second Research Data Management (RDM) 101 course for 2014 on 20-22 May at the I.T. Learning Center, IRRI Headquarters. Eleven participants completed the training including staff members from PBGB, SSD, and CESD as well as Bangladesh, Malaysia, Vietnam, and Iloilo, Philippines. RDM 101 covered all areas of data management, including planning, documentation, collection and pre-analysis, storage and backup, and archival and sharing. International standards regarding information security was also briefly discussed. The training also introduced tools and software, such as Dataverse, Google Drive, Beyond Compare, and Mendeley, that can aid in research data management while Carlos Ortiz (ITS) provided support on the use of the virtual machine clients. The training team, managed by Menchu Bernardo IRRI-RMQA Senior Manager, includes Icoy Mercado and Dec Arreza. Several high ranking government officials from Thailand, the Philippines, Indonesia, Viet Nam, and Malaysia have visited IRRI over the past two weeks to strengthen collaboration between their respective countries and the Institute. The VIPs were welcomed by IRRI officials led by IRRI Director General Robert Zeigler, Deputy Director General for Communication and Partnerships Bruce Tolentino and Partnerships Office Head Julian Lapitan. Thailand’s Rice Department Director General Chanpithya Shimpalee and party visited IRRI on 14-15 May. Aside from an overview of the Institute’s research agenda, the officials met with GRiSP Director Bas Bouman and the program's theme leaders to discuss GRiSP's different research areas. Over its 50-year partnership with Thailand, IRRI’s rice research targeted pest management, genetic diversity conservation, and growing rice in unfavorable environments which helped increases Thailand’s rice production, making it one of the world’s biggest exporters of rice. Working closely together, IRRI and Thailand created the Thai Rice Knowledge Bank which highlights country-specific, up-to-date information on rice and rice-based cropping systems for farmers and extension workers in Thailand. Fifteen members of the House of Representatives visited on 19 May. The lawmakers from the House committees on Agriculture and Food, Science and Technology, and Food Security were updated on the latest developments in rice research. The partnership of IRRI and the Philippine government dates back in 1960 when the Institute was founded. Through the Department of Agriculture, 107 IRRI-developed varieties suited to irrigated and upland areas, saline environments, and low-temperature have been released to help raise Filipino farmers’ productivity and income. Dr. Rusman Heriawan, vice minister of Agriculture of Indonesia, and party visited on 20 May. The state officials were interested in IRRI's research activities as a strategy for poverty and hunger alleviation. For more than 30 years, Indonesia and IRRI's collaboration has generated rice technologies to help maintain the country’s rice self-sufficiency which it has achieved since 1984. Vietnam’s Minister of Agriculture and Rural Development Cao Duc Phat and party visited on 21 May. The visit was set to further discuss IRRI’s technical assistance to different programs and missions with Vietnam. Vietnam and IRRI have worked hand in hand in areas of varietal improvement, conservation of rice diversity, sustainable farming systems, and capacity building since 1963. As of 2012, 89 IRRI-bred lines have been released as varieties in Vietnam. Malaysia’s Minister of Agriculture Secretary General Y Bhg Datuk Seri Mohd Hashim Bin Abdullah and his delegation visited IRRI on 21 May. The officials learn more about the Institute’s research activities. Malaysia’s partnership with IRRI started in 1963 and has since worked on the development of hybrid varieties, mechanization of seed production, and ecological engineering approach in irrigated rice ecosystem. As of 2012, 16 varieties have been released as varieties in Malaysia. These visits highlight the strong partnership between IRRI and NARES which has greatly strengthened the development and delivery of appropriate and up-to-date sustainable rice growing technologies to farmers. The IRRI-Japan Collaborative Research Project on Climate Change Adaptation in Rainfed Rice Areas (CCARA) held its 4th Annual Review and Planning Meeting in Vientiane, Lao PDR on May 9-10, 2014. Vientiane, Lao PDR was the same venue for the same event two years ago. This year, in addition to the research progress review, the event highlighted the Weather-Rice-Nutrient integrated decision-support system (WeRise) prototype. WeRise is a decision support tool being developed by CCARA that builds on existing knowledge, database, and tools, and integrates seasonal weather forecast and real-time weather data with the crop models and nutrient management tools. WeRise is a promising tool that could help farmers, researchers, and extension workers on their crop production decisions by providing crucial weather information such as start and end of the rainy season during the cropping season and the distribution of rainfall. It also gives advice on optimum planting times, which variety to use, and the amount and timing of fertilizer application in rainfed rice areas under current and future climate conditions. Plans for field testing of the WeRise prototype were discussed during the planning meeting with collaborators from Lao PDR and Indonesia. In his welcome remarks, Dr. Vanthong Phengvichit, Deputy Director General of the National Agriculture and Forestry Research Institute (NAFRI) emphasized the importance of forecast for farmers in the context of climate change. 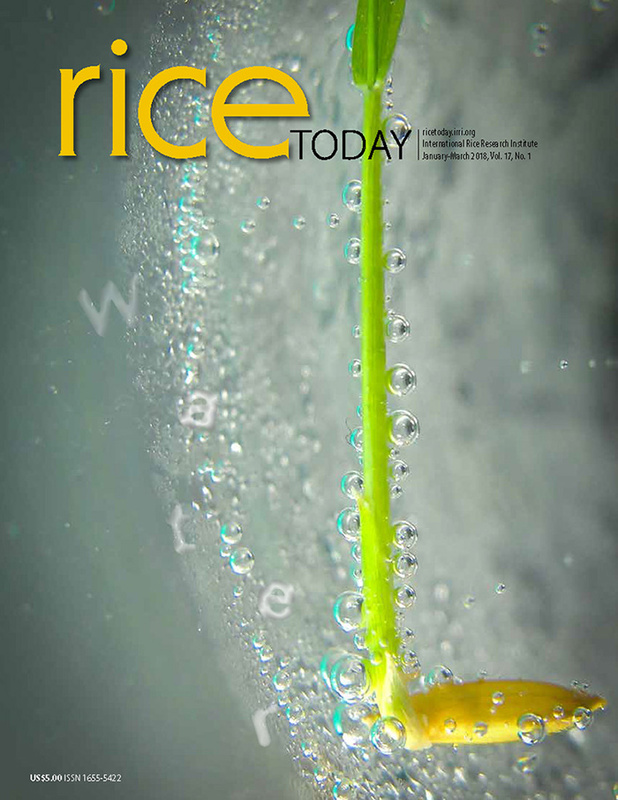 Climate change poses the threat of extreme weather events that, in turn, create uncertainties in rainfall: too much or too little of it, or rain coming at the wrong time, can adversely impact the productivity of rice farming in rainfed areas. Dr. Tomoyuki Kawashima, program director on natural resource management of the Japan International Research Center for Agricultural Sciences (JIRCAS) commended CCARA’s accomplishments and encouraged the team to share its outputs to other projects and create synergies. He hopes that the project would help improve rainfed rice production. Organized by IRRI, JIRCAS and NAFRI, thirty-six collaborators and observers from Laos, Indonesia, Japan, and the Philippines attended the event. The IRRI-Japan Collaborative Research Projects have been funded by the government of Japan through the Ministry of Agriculture, Forestry, and Fisheries (MAFF) since 1984. CCARA, which is the latest project, was launched in August 2010 and will end in September 2015.
and Spider Taxonomy Workshop at Valencia Bukidnon. IRRI entomologists facilitated three workshops with partners in Bukidnon, Mindanao between 28 April and 2 May 2014. On April 28, 25 participants from the Agriculture Department of Central Mindanao University (CMU) completed a workshop on Sustainability of Rice Production Systems. The workshop was conducted at the AACCUP room at the College of Agriculture in CMU (Musuan). Under the guidance of instructors from IRRI (Finbarr Horgan & James Villegas) and DA-RFU X (Gregorio Orboc), the students examined aspects of sustainable rice crop management and evaluated rice production systems using a series of simple sustainability indicators. Furthermore, microscopes and books were donated by IRRI to the University to support future research in integrated pest management for the region. On April 29, partners from the Department of Agriculture (of the Philippines)-Bureau of Agricultural Research (DA-BAR)-funded project ”Developing Ecological Engineering Approaches to Restore and Conserve Ecosystem Services for Pest Management and Sustainable Rice Production in the Philippines” completed an evaluation and planning workshop to review research activities to date and define research and outreach activities for the remainder of 2014. The workshop was conducted at Jocel’s Gardens (Valencia). Participants were from IRRI (Entomology – Finbarr Horgan, James Villegas, Angelee Fame Ramal, Josie Lynn Catindig and Ellen Genil; Experimental Station – Rod Tomambo), DA-RFU IV-A (Alexandra Jamoralin, John Michael Pasang), DA-RFU VI (Corazon Arroyo, Virginia Agreda), DA-RFU X (Gregorio Orboc, Tito Manigos), farmer participants from Colonia, Bukidnon (James Lopez, Josephine Alubog), and evaluators from the DA-BAR (Quezon City)(Raymond Patrick Cabrera, Jay Invinsor Bermas). Finally, between April 30 and May 2, partners in the project, together with two professors and five students of entomology from CMU attended a workshop on Basic Insect and Spider Identification. The workshop, held at Jocel’s Gardens (Valencia) was conducted by IRRI entomologist Josie Lynn Catindig with visits to rice eco-engineering field sites at Colonia (Valencia, Bukidnon) and to the biological control facilities at Bangcud (Malaybalay, Bukidnon). Fourteen participants completed training which allows them to separate insect and spider samples collected from rice fields into families and, in some cases, genera. The workshop also gave basic tools to participants to support further progress in taxonomic studies. (1) Evaluation and Planning Workshop with Partners from DA-BAR and DA-RFUs was held at Jocel’s Garden in Valencia, Bukidnon. Top Left to Right: James Villegas (IRRI), Finbarr Horgan (IRRI), Rod Tomambo(IRRI), Jay Bermas (DA-BAR), John Michael Pasang (DA-RFU IV-A), James Lopez (Partner Farmer Bukidnon) and Gregorio Orboc (DA-RFU X); Bottom Left to Right: Josie Lyn Catindig (IRRI), Ellen Genil (IRRI), Fame Ramal (IRRI), Virginia Agreda (DA-RFU VI), Corazon Arroyo (DA-RFU VI),Alexandra Jamoralin (DA-RFU IV-A) and Patrick Cabrera (DA-BAR). (2) Basic Insect and Spider Taxonomy Workshop Participants at Valencia, Bukidnon. From left to right: James Lopez (local farmer), Aljun Perez (CMU), Roger Menisterio (CMU), Romel Gallardo (CMU), Alexandra Jamoralin (DA-RFU IV-A), Josephine Alubog (local farmer), Virginia Agreda (DA-RFU VI), Josie Lyn Catindig (IRRI), David Marapao (CMU), Ever Orboc (CMU), James Villegas (IRRI), John Michael Pasang (DA-RFU IV-A) and Tito Manigos (DA-RFU X). A two-week course called Rice: Post-Production to Market was conducted at IRRI headquarters from April 28 to May 9, 2014. Sixteen rice specialists from different countries-- Bangladesh, India, Indonesia, Myanmar, Philippines, and Thailand--signed up for the course. The training aimed to instruct the participants how to (1) identify and measure losses throughout the post-production chain, from harvest to market; (2) evaluate technology options for harvesting, threshing, drying, storage, and milling of paddy; and (3) learn how to use methodologies and tools to assess local post-harvest chains, mapping of actors, and use of a business plan for introducing or scaling out suitable technology options. A series of lectures and hands-on exercises were conducted to help participants gain the skills that they need to become certified basic postharvest trainers. They were given in-depth lectures on the important aspects of rice postharvest process: Harvesting, Drying, Milling, Machineries, Measurements and Calibration, Seed Quality, Storage, and Business and Project Planning. A new module on rice markets and marketing was also introduced. The Rice: Post-Production to Market Training course was conducted by the Postharvest Unit of CESD and the Training Center. The second course will be held on October 2014 and are now accepting applicants. Interested trainees may check this link for more details. Last May 9, 2014, IRRI welcomed 15 delegates of the Konrad Adenauer Asian Centre for Journalism at the Ateneo University de Manila MA Journalism Program and their professor Dr. Inez Ponce de Leon. The Media Day was organized by the Communication team and in line with the delegates’ task to produce an output on topics discussing climate-smart rice, high-iron rice, pest-resistant rice & ecological engineering. The delegates and representatives from Communication also held a dialogue discussing best practices in science communication. The delegates were Mr. Aditya Wardhana (PTV Indonesia), Ms. Susana Arcan (National University), Mr. Jimwel Balunday (NDRRMC), Ms. Rowena Bumanlag (Carabao Research Center), Ms. Karizza Cumpas (UST), Mr. Rommel David (GMA 7), Mr. Luis de la Vega (Inquirer), Mr. Paterno Esmaquel (Rappler), Mr. Roel Hernandez (National University), Mr. Dandy Koswaraputra (Bloomberg), Mr. Cheng Chooi Teoh (Malaysia), Ms. Victoria Tulad (GMA 7), Ms. Anna Valmero (Climate Change journalist), Ms. Maria Villaflor, and Ms. Chiara Zambrano (ABS-CBN). IRRI experts present were Dr. Glenn Gregorio (Climate-smart rice), Dr, Abdelbagi Ismail (Climate-smart rice), Dr. Jessica Rey (High-iron rice), Ms. Camile Diaz (High-iron rice), Dr. Nancy Castilla (Pest-resistant rice & Ecological engineering), Mr. James Villegas (Pest-resistant rice & Ecological engineering), and Dr. Casiana Vera Cruz (Heirloom rice). During lunch, a communication seminar was conducted by Dr. Inez Ponce de Leon. Afterwards, the delegates were given a tour of the International Rice Gene Bank, the Scuba Rice Experimental Plot, and the Riceworld Museum. The Young Researchers Lunch on 6 May 2014 hosted Dr. Rod Wing. Dr. Wing is a professor at the University of Arizona, USA, Director of the Arizona Genomics Institute, and recently appointed AXA-endowed scientist at IRRI for Genome Biology and Evolutionary Genomics. He answered many of the group's questions about genome sequencing and he listened to their ideas about phenotyping stategies. Participants were Tanay Joshi, Nurul Hidayatun, Frederickson D. Entila, Anchilie Francisco, Vito Butardo Jr., and Christian Paolo Balahadia. Members of the Council for Partnership in Rice Research in Asia (CORRA) shared their visions, strategies, and plans for the development of their rice sectors at a recent workshop jointly organized by CORRA and the Global Rice Science Partnership (GRiSP). The workshop aimed to ensure that the activities of IRRI and GRiSP are broadly supportive of the aspirations and plans of the CORRA members. About 40 representatives from CORRA member countries in South and Southeast Asia, IRRI staff from HQ and country offices, FAO, and CIAT participated in the CORRA-GRiSP workshop held in Putrajaya, Malaysia on 6-7 May 2014. The Malaysian Agricultural Research and Development Institute (MARDI) hosted this event. The senior officials of the National Agriculture Research and Extension Systems (NARES) of the various CORRA countries presented their respective national rice sector status and programs. The reports by India, Indonesia, Lao PDR, Malaysia, Myanmar, the Philippines, Thailand, Iran and Vietnam contained very useful information on the statuses and directions of the rice sectors of the participating countries. The information from the plans will guide the work of the CORRA and GRiSP, particularly in setting the directions and the allocation of resources in support of global rice research. The next step is to enable more Asian countries and NARES to prepare and share their own plans. Arrangements will also be made for regular updating of the plans in future years. It is expected that the CORRA ministerial meeting at the International Rice Congress (IRC) in Bangkok in October 2014 will be another important venue for sharing and collaboration toward the successful implementation of the plans and strategies. This year's farmers’ festival in Batac, Ilocos Norte, Philippines featured the 2014 Cybervillage Olympics, an IT-focused event organized by the Philippine Rice Research Institute (PhilRice) and the City Agriculture Office with support from the International Rice Research Institute (IRRI). Farmer-partners from four barangays in Batac participated in activities such as jingle writing and singing contests, a message relay race, a computer dismantling competition and one on downloading a Rice Crop Manager recommendation, and a quiz bee. A learning alliance (LA) meeting on linking with markets was conducted last 2-3 May 2014 in Yangon. About 25 alliance members, farmers, private sector, and NGO partners from Bogale and Maubin townships attended the event. The participants visited a wholesale rice trading depot in Wadan and an export market in Bayint Naung area to interact with traders and learn about quality, varieties, logistics and pricing of grains. The group also interacted with members of Myanmar Rice and Paddy Traders’ Association (MRPTA) and township trade leaders to know more about trading practices. With the emphasis on producing good quality from good seeds, farmers met with staff of the Hmaw Bi Seed farm to learn about available seeds and seed production. U Kyaw Ei, a Bogale rice farmer, said that Bogale rice is priced the lowest of nine townships trading the same variety in Wardan. From milled rice samples of traders, he saw the low price has to do with low quality grains. For Maubin and Bogale LA, the learning cycle on varieties and postharvest will continue for the monsoon season 2014. IRRI Training is currently holding a workshop on Single Nucleotide Polymorphism (SNP) Data Analysis from 5 - 9 May 2014 at the IRRI Training Center. The workshop aims to develop the skills of rice researchers on SNP analysis and bioinformatics. It includes hands-on computer training, where the participants will work on exercises individually with assistance from resource persons. According to Maria Ymber Reveche, Associate Manager- Research Support of the Plant Breeding, Genetics, and Biotechnology Division (PBGB), the workshop introduces the participants to the tools available to discover SNP markers related to important traits which can be used for the improvement of rice varieties. The workshop is offered to researchers and scholars who conduct SNP analysis in their research. A total of 21 participants from different countries in Asia are being trained on the workshop. Coordinators of the workshop are Dr. Michael Thomson, Scientist, Molecular and Marker Applications of IRRI-PBGB, Dr. Ramil P. Mauleon, Scientist and Bioinformatics Specialist of IRRI T.T. Chang Genetics Resources Center (TTC-GRC) and Dr. Kenneth McNally, Senior Scientist for Computational Biology. Serving as a catalyst for philanthropic investment in Asia, three delegates of US-based social enterprise Give2Asia visited IRRI to learn about the Institute’s research activities and explore possible areas of collaboration on 6 May 2014. IRRI Director for External Relations Corinta Guerta welcomed the delegates led by Give2Asia Vice Chair Teresa Orr. The visitors received an overview and learned about the Institute’s mission. IRRI principal scientist Roland Buresh gave a presentation on the Rice Crop Manager. The delegates had the opportunity to interact with scientists during their tour of the International Rice Genebank, Grain Quality and Nutrition Center, and the Postharvest Center. IRRI has partnered with Give2Asia, which ensures safe, effective and impactful international philanthropy, in order to engage more donors who share IRRI’s cause. The donations received through Give2Asia support IRRI’s work with hundreds of research and development partners across Asia. The training program on version 3 of ORYZA, a system analysis tool for rice production, was held at the IT Learning Center in IRRI on 31 March-4 April 2014. There were 24 training participants from Bangladesh, India, Sugar Regulatory Administration and IRRI Headquarters. The training aimed to help the participants become familiar with the basic structure and functions of the newly released ORYZA version 3. The program also aimed to explain data preparation for modeling studies, setting of parameters, calibration of the model, interpretation of output, and analysis of different crop management scenarios. ORYZA is an important tool that scientists can use to extrapolate their research results, verify various hypotheses prior to possible experimentation, evaluate the impacts of climate change, rice variety, and technology dissemination on rice production, and aid in rice breeding. The training team at IRRI is composed of Tao Li, Ando Radanielson, Olivyn Angeles, Man Marcaida, and Mahlie Manalo, with Lolit Adriano as secretary. Elected officers of the Sulo ng Pamayanan took their oaths of office on 25 April 2014 at the Pamana Resort. IRRI’s Partnership Office afterwards facilitated the team building. On April 24, the elected officers had a planning activity at IRRI. The Sulo ng Pamayanan is a non-profit organization organized by IRRI’s Partnerships Office ( Philippine Desk), that aims to encourage and empower women to be effective leaders of the community. The newly elected officers of Sulo presented the background of the organization and its future plans for livelihood, health and women empowerment during the team building. The Team Building activities focused on achieving values on leadership and being a team such as unity, patience, initiative and timing, and the importance of communication. An initiative that started as a livelihood project for the residents in San Agustin, Bay, Laguna on 2012, has finally reached the people of Los Baños. On 29 April 2014, the Public Employment Service Office (PESO) of Los Banos, in partnership with the International Rice Research Institute (IRRI), conducted a paper bag making activity for senior citizens. Mr. Joselito Platon, associate for Philippine desk at IRRI, facilitated the training for the senior citizens in Los Baños. PESO and IRRI hope to inspire these senior citizens to form a group and make use of the skill they have obtained in order to generate income. The paper rice bag making was initiated for the residents of San Agustin, in Bay last 2012. IRRI buys the paper bags from them as containers for the brown rice tokens given to VIP guests and visitors in the Institute. The Partnerships Office of IRRI continued to reinforce its partnership with the Public Employment Service Office (PESO) of Los Baños, Laguna in offering livelihood courses and technical skills training to the unemployed residents of Los Baños and Bay. PESO is the government’s arm in addressing education and employment issues. IRRI funds the following training programs for 2014: Refrigeration and air-conditioning technology, installation and electrical maintenance, domestic household appliance and electronics repair, and basic cosmetology course, Ganda Mo, Hanapbuhay Ko (in partnerships with the Ang-Hortaleza Foundation). Completion of each of the courses will allow graduates to take the National Certification II (NC II) from the Technical Education Skills and Development Authority (NEDA). The NC II certificate is globally accepted and increases a person’s chance of being accepted for employment in other countries. IRRI sponsors this training programs to help its host communities improve livelihood opportunities for its low-income residents, and lessen concerns that may be caused by unemployment in the areas, especially in the areas of security, and peace and order. Presently, the PESO offers free training programs for computer hardware service II, carpentry II, basic plumbing II, automotive servicing II, dress making, electrical maintenance II, ref and air-conditioning technology II, basic cosmetology, motorcycle technician, and call center training/ English proficiency. Each class can accept a maximum of 60 participants per course. Classes are held every Saturday. please contact the PESO Manager, Ms. Glecy Trinidad at 049-536-5976. The 12th Training Workshop on Rice Technology Transfer Systems (RTTS) in Asia was held at Suwon, Korea on 21 April-2 May 2014. RTTS was a joint collaboration of the IRRI Training Center (TC) and the International Technology Cooperation Center (ITCC) Rural Development Administration (RDA). This annual event aimed to showcase South Korea’s latest rice technology systems and agricultural linkages as well as to inspire and share rice farming knowledge that could be applicable to the participating South East Asian countries. Since 2002, RTTS has served as an avenue for knowledge sharing and rice technology transfer among participating countries. These countries were Cambodia, Indonesia, Lao PDR, Myanmar, Philippines, Sri Lanka, South Korea, Thailand, and Vietnam. Training Center’s Head Noel P. Magor, and Senior Training Specialist Ms. Maria Socorro S. Arboleda were workshop resource persons together with the resource persons from ITCC RDA. The Bangladesh Agricultural University honored renowned IRRI scientist, Dr. Uma Shankar Singh, Senior Scientist (II) & South Asia Regional Project Coordinator, Stress Tolerant Rice for Africa and South Asia (STRASA) in recognition of his remarkable contribution to ensuring food security by enhancing the rice productivity in the country. Prof. Md. Rafiqul Hoque, Vice-Chancellor, Bangladesh Agricultural University (BAU) presented the award to Dr. Singh in a special ceremony organized by the university on 24 April 2014 at its campus in Mymensingh, Bangladesh in the presence of over 250 researchers and officials of Bangladesh Agricultural University (BAU), Bangladesh Institute of Nuclear Agriculture (BINA), Bangladesh Fisheries Research Institute (BFRI) and IRRI. In his address, Prof. Hoque applauded the prolonged partnership of the university with IRRI and the contribution of Dr. Singh in improving the livelihood of poor farmers by promoting and disseminating the seeds of stress tolerant rice varieties to increase and stabilize the rice yield in the unfavorable areas of the country. “There is strong need to strengthen this bilateral cooperation between IRRI and BAU to nurture the research fraternity for scientific excellence,” he said. Dr. Uma Shankar Singh, while receiving the award, thanked the university for recognizing the contribution of IRRI and highly acclaimed the role of BAU management, researchers and other national partners in developing and disseminating the stress tolerant rice varieties in the country and taking them to larger masses in a very short span of time. “We value our strategic partnership with BAU and extend full support to this endeavor of ensuring food security and eliminating hunger and poverty in the region,” he said. Dr. Subash Chandra Chakraborly, Director General, BFRI and Dr. M.A. Bari, Project Scientist, BMGF-STRASA, IRRI, Dhaka graced the occasion as special guests. Professor Dr. Lutful Hassan, Director, Bangladesh Agricultural University Research System (BAURES) chaired the session. Rice: Post-Production to Market Course addresses the problem of post-production losses that causes deprivation of food security and income to farmers and other chain actors. Wanting to improve their country’s rice post-production gain, 16participants from Bangladesh, India, Indonesia, Myanmar, Philippines, and Thailand participated in the said course. During the training, participants will have hands-on experience with harvesting and other post-harvest procedures. According to Alfred Schmidley, course co-coordinator and Business Model & Value Chain Specialist, letting participants have hands-on activities do not just train them but make them appreciate the hard work associated with rice farming. By the end of the course, they will receive a certificate classifying them asqualified evaluators and introducers of garnered rice knowledge. The participants are expected to be capable of evaluating sources of post-production losses, and the different techniques to manage preventable losses. They must also be familiar with the IRRI Quality Kit used in assessing paddy, milled rice and seed. They must be able to assess rice market and rice standard quality, and design a project and business plan. Since they will be introducing new knowledge, they will also be taught how to use the Rice Knowledge Bank (RKB), a free-access website that stores all rice science information from experiments in IRRI. RKB is a resource in teaching rice farming especially post-production techniques. Equipped with the latest practical knowledge in rice production for farmers in developing countries, the new and updated Rice Knowledge Bank (RKB) was launched on 2 May 2014. The world’s leading repository of extension and training materials in rice production showcases rice production techniques, agricultural technologies, and best farming practices based on IRRI’s pool of knowledge from research findings, learning and media resources, and in-country projects. Its content highlights step-by-step production from pre-planting to postharvest management. It also includes decision tools and agronomy guides that can help farmers make sound farming decisions. “The Rice Knowledge Bank provides our partners in national agricultural research and extension systems (NARES) and NGOs with an ever-increasing wealth of information on training and rice production which they share with local farmers,” said Mr. Julian Lapitan, head of Partnerships and the Philippine Desk at IRRI. In addition to the new, user-friendly design, the Rice Knowledge Bank now features country-specific information developed through IRRI projects in countries such as Bangladesh, Cambodia, India, Indonesia, Lao PDR, Myanmar, Philippines, and Vietnam. Other partners include several countries in Africa such as Kenya, Mozambique and Tanzania. Check-out the new and improved Rice Knowledge Bank at http://www.knowledgebank.irri.org/.